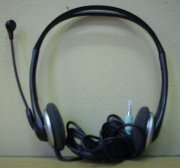 All you have to buy, if you don’t already have it, is a headset. This one is available at Matrix. Price R69. You don’t need a more expensive headset than that. You also need software that will enable you to record. This you can download for free. I use Audacity. It’s easy to use and quite good. Download it here. If you need any help or advice, contact De Waal. I’ll try my best to help.